I’ve mentioned how much I love the Christmas lights scene in National Lampoon’s Christmas Vacation previously on Babyology. In fact, I think of that scene every year when I put up our handful of fairy lights. It takes me about half an hour to string our meagre three-hundred-and-fifty lights. Even so, there are ladders, hooks, tape and sometimes swearing involved. So I do wonder how long the Richards family, of Forrest in Canberra, spent putting up more than half a million lights! This year, David Richards took a week off work in October to begin transforming his house and yard. The work didn’t end there – David, his family and friends put in weekends as well in the lead-up to December. They’ve created a fifty metre walk-through fairy-light canopy and a light-controlled tree, both of which are synchronized to music. 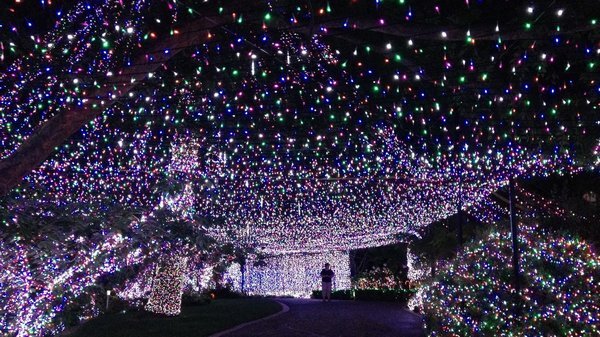 In using more than 502,000 LED lights, the Richards have broken the Guiness World Record for the number of Christmas lights. Richards says that it costs about $2500 per month to power the display (thankfully a local renewable energy company has come to the party!). Hmmm – I think I’ll stick with my three-hundred-and-fifty lights!